Blog Hoppin’ – a new teacher blog is authored by some of your favorite teacher bloggers and is offering a buffet of ideas. They are committed to providing posts about, links to, and recommendations for the best teaching resources out there. To kick off their new blog they are having a celebration for US-teachers of every grade, and school size. It all begins tomorrow the 22nd and runs through Friday the 26th so get ready to HOP on over with your posts and ideas. - Meet the Teacher Monday – Introductions, please! Tell us all about you! - Where it All Goes Down Wednesday – Pictures, please! Show us your classroom! 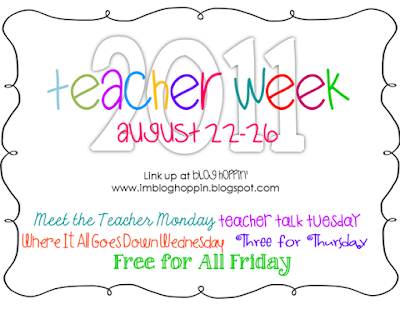 - Three for Thursday – Link to your favorite font, favorite blog, and favorite online resource. - Free for All Friday – Everyone loves a freebie! Link up with a printable that you’ve created and would like to share out with the teaching community. It's begining to look a lot like a school year.